Today, I'm here to share another of my Whole30 dinner creations... 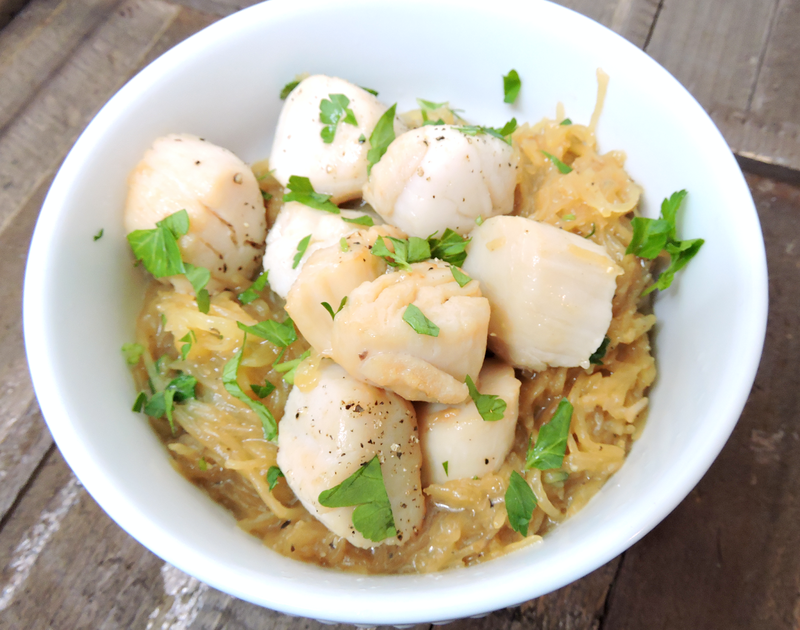 Lemon Garlic "Pasta" with Scallops! 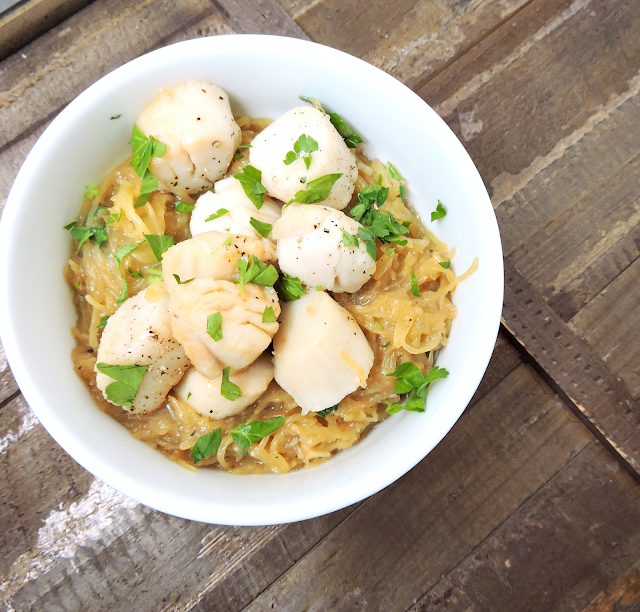 The "pasta" is spaghetti squash, and I made a quick, creamy sauce using the pan drippings from the scallops that is bursting with flavor. My favorite part about this dish is the balance... it tastes light & fresh, but is still hearty & filling. This would be great any time of year, but I love how it brightened up our winter menu; a nice break from heavier soups & chilis. Both the spaghetti squash & scallops I used are from Costco. I love that they offer high-quality wild scallops that are frozen, so you can thaw as many as you'd like at a time. I hope you enjoy this as much as we did! Try it for a nice lunch when entertaining, or dinner anytime. It's not as difficult as it looks! 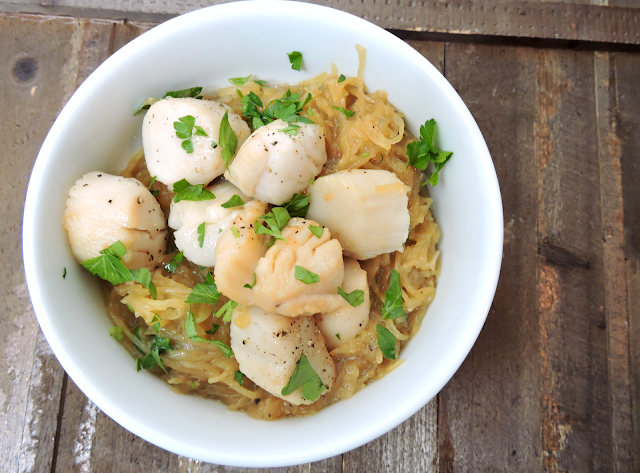 This dish is also Paleo-friendly, grain & dairy free, and Whole30 compliant. Preheat the oven to 375ºF. Line a baking sheet with aluminum foil. Cut the spaghetti squash in half through the length, then place the open sides down. Bake for 40-45 minutes or until tender enough to scrape out with a fork. Scrape the spaghetti squash into a large bowl, season with salt and pepper, and set aside. Sauté the scallops in 2 Tbsp of cooking oil over medium to medium-high heat until lightly browned and just cooked through. Transfer the scallops to a plate while you make the "sauce". Over medium heat, add 2 Tbsp of oil and 1 tsp of minced garlic to the pan drippings. Stir for about 2 minutes to cook the garlic, but don't let it burn. Sprinkle 2 Tbsp of arrowroot flour into the pan, and stir to make a paste. Pour in the 1/4 cup chicken broth and 1/3 cup coconut milk, stirring continuously until the sauce is thickened and bubbly. Reduce the heat to medium-low, and stir in the cooked spaghetti squash. Add the fresh parsley and lemon juice. Stir and cook until the spaghetti squash is warm and coated in the sauce (just a few minutes). Stir in the scallops until warm, or serve them over top of the "pasta". Garnish with another dash of salt & pepper, extra fresh parsley, and a squeeze of lemon.